Long before their college days at Parvoo U., our two amateur electronics sleuthing buddies were on the job tracking down and trapping bad guys by using their combined knowledge of circuits and physics. In this episode, Carl and Jerry are tasked with helping a hobby store owner stop a rash of thefts that always seems to occur during a busy time right after school lets out for the day. Their first inclination was to devise a system like the big department stores were installing that used passive tags on items that would trigger an indicator when passed through the detector at the exit door. That was in 1958 (the year I was born, yikes!) when the anti-theft tags were first being utilized. Unfortunately, the system they were able to build was not sensitive or selective enough, so they came up with a different scheme that helped the storekeeper nab the perp. It was quite elementary, as a world-famous detective was fond of saying. A February snowstorm was swirling around outside as Carl Anderson came stamping into the basement laboratory of his friend, Jerry Bishop. His horn-rimmed glasses instantly steamed over in the warm room, and when he took them off he saw that Jerry had company. A pleasant-featured young man was sitting on the worn leather sofa watching Jerry doing something at his workbench. "Hi, Carl; this is Mr. Singer who owns that hobby shop at Fifth and High," Jerry announced. "He's got a problem." "Glad to know you, Carl," Mr. Singer said, as he stood up and shook hands. "I've got a problem all right. Shoplifters have really started working me over. As you know, our merchandise is mostly on open display so that the youngsters who make up a large part of our trade can handle it. That makes it easy picking for anyone so inclined. Naturally we expect some losses of this nature, but recently they've become serious." "What sort of things are snitched?" "Everything from a bicycle on down! However, that fancy cap pistol Jerry has over there on the bench seems to be a favorite. We've lost a couple of dozen of those since school started." "Then it must be children doing it." "That's right; and that's what makes catching the sticky-fingered person such a ticklish proposition. Maybe I'm a softy, but I don't want to call the police in on this and maybe send some kid to reform school. I just want to find out who's doing it and put a stop to it. I feel I have to show the kid doing it that no-one gets away with what he's pulling for long; otherwise he may develop into a real criminal." "Don't you keep an eye on things?" Everything was built on a flat sheet of Bakelite that fitted easily beneath the cardboard shelf to which the pistol was securely fastened. "We try, but you can't appreciate what a job it is until you see the after-school crowd that jams into our store. We have all we can do waiting on trade, stopping scuffling, etc., without trying to watch all the counters and aisle displays at once. And the thief is pretty crafty. We thought we could stop the loss of the pistols by wiring them in their boxes; but they kept right on disappearing, box and all!" "Carl, you're just in time to help me try something," Jerry interrupted. "I read the other day that some big department store had installed an electronic shoplifting detecting device that was triggered whenever a special price tag, actually a miniature printed tuned circuit, was brought near it. Price tags were removed from all merchandise when sold; so if anyone tried to carry something off without buying it, the electronic gadget would squeal on him. "I figure the detecting device must be simply a glorified grid dip oscillator such as the one I have here on the bench. As Carl knows but possibly you don't, Mr. Singer, a 'GDO,' as we call it, is simply a vacuum-tube oscillator with a meter that reads the rectified grid current which flows from the tube grid to ground as long as the tube is oscillating. The amount of grid current is proportional to the vigor of oscillation. Whenever another circuit tuned to the frequency at which the GDO is oscillating is brought near the coil of the oscillator, this tuned circuit absorbs energy from the oscillator by induction. This cuts down on the vigor of oscillation and produces a reduction or 'dip' in the current reading of the meter." "I see that this loop of wire strung around the door frame is replacing the coil ordinarily plugged into the GDO," Carl observed. "That's right. And this little coil-and-capacitor combination is tuned to the frequency at which the grid dip oscillator is working. I want you to walk back and forth through the door without it first - then again with it in your hand." As Carl made the last trip, Mr. Singer walked over and watched the meter. "The pointer moved!" he exclaimed. "Yes, but not enough I'm afraid," Jerry said. "I was hoping we'd get a really strong kick that would operate a sensitive relay. And there was a current change caused by body capacity effect when Carl went through the loop without the tuned circuit. Probably we could get away from that by housing the loop of wire in some sort of Faraday shield which would stop capacity effects without interfering with magnetic induction ... and we could amplify the grid current change with a d.c. amplifier until it would kick a relay. But I'm afraid all that wouldn't be practical for just this one job." "Well, I'm sorry you can't help, but I certainly appreciate your trying," Mr. Singer with obvious disappointment as he began buttoning his overcoat. "Wait a minute!" Jerry exclaimed. "We don't give up that easily. I've got another idea that should be sure-fire." "Let's hear it," Mr. Singer said, sitting down again. "Well, I've been looking at this cap pistol carton, and I see there's plenty of room beneath the cardboard insert that holds the pistol for us to conceal a transistorized, tone-modulated transmitter. This will have a range of only about 50 feet; so if the pistol is placed on a counter at the rear of your store, the signal won't be heard on the receiver we'll place near the front door - with an antenna lead from the receiver fastened around the door frame. However, if anyone tries to carry the pistol and transmitter through the door, the signal from the transmitter will be heard very loudly in the receiver." "Sure it will work?" Mr. Singer quizzed. "Sure I'm sure," Jerry said confidently. "Carl and I have played around with these transistorized wireless mike circuits a lot, and we know how to build them and what they will do. Suppose you don't display the cap pistols for a couple of days while Carl and I build up the transmitter and check it out. Then you can put this special one on display, and the kid pinching them will probably snap it right up." "That's exactly what I'll do," Mr. Singer agreed. "Just let me know when you're ready." The door had hardly closed behind him before Carl and Jerry were busy laying out the little transmitter. 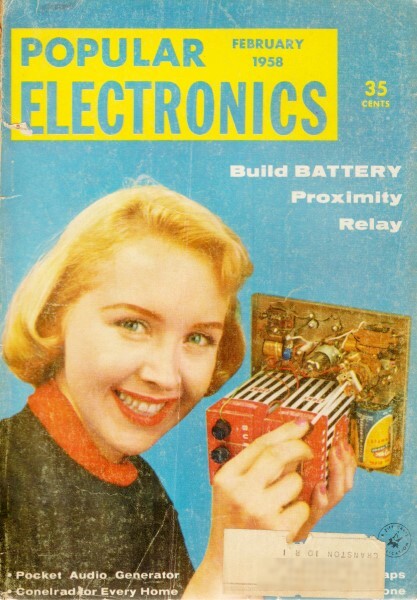 There was no problem with the circuit, for all they had to do was combine a transistorized "wireless mike" transmitter and a simple transistorized audio oscillator. The audio oscillator replaced the microphone of the transmitter and modulated the output with a steady tone of about 500 cycles per second. The transmitter was set to work on an unused area near the low end of the broadcast band so that an ordinary radio could be used to pick up the signal. Everything was built on a flat sheet of Bakelite that fitted easily beneath the cardboard shelf to which the pistol was securely fastened. When the equipment was working to their satisfaction, the boys contacted Mr. Singer; and that evening the three of them went down to the store and set up "Elmer, the Electronic Flatfoot," as Carl insisted on calling it. Everything worked exactly as Jerry had predicted. 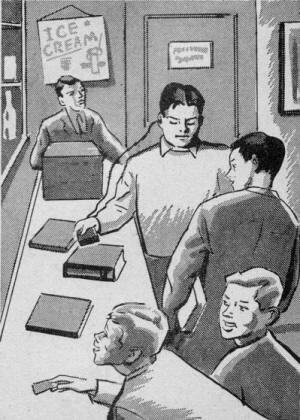 It was agreed the boys would rush right to the store from school the next day and that Mr. Singer would not put out the pistol until they arrived. It seemed as though school would never let out the next afternoon, but when it finally did Carl and Jerry really hot-rodded their bikes down to the store. Mr. Singer was waiting for them. Jerry switched on the hidden transmitter, and the "bait" was provocatively displayed. Almost immediately the store began to fill with a crowd of shouting, shoving, noisy boys. Jerry and Carl stayed near the front of the store and deliberately avoided even looking at the counter holding the cap pistol. Mr. Singer, his wife, and two clerks were busy waiting on customers. Removing the receiver from his shirt pocket, he used it as a search wand to go over each one. A good half hour passed without anything happening. The boys were just beginning to think that no one was going to try to make off with the pistol when they heard a weak musical tone in the receiver. Steadily it increased in strength. Mr. Singer heard it and came over to stand by Carl and Jerry. As two well-dressed boys carrying school books went through the door, the tone reached a very loud level and then began to subside. Mr. Singer called after them: "Say, fellows, come back here a minute. I want to talk to you." The two schoolboys exchanged a long look and then slowly came back to the store. As they crossed the threshold, the receiver once more built up to a peak of sound. "Come on back to my office," Mr. Singer said. They walked back with him, tossing their books on an empty counter as they went past. 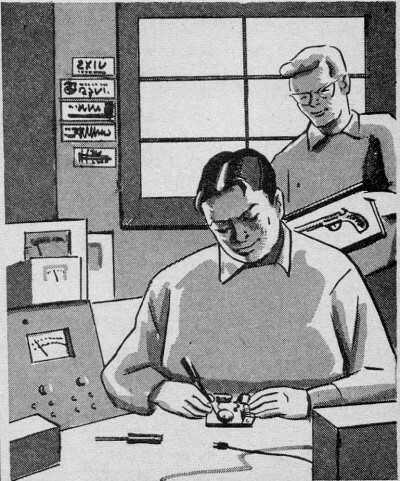 Carl and Jerry followed, and for the first time Carl noticed that Jerry was wearing his little shirt-pocket transistor receiver with its earphone tucked in his ear. Carl also noticed that as Jerry walked along just behind the two boys he kept fumbling with the tuning control of this receiver, and his face had begun to wear a puzzled, worried look. "I was going to use this to tell which one had it," he whispered to Carl, "but I can't pick up the signal near either of them!" "Maybe the transmitter's gone dead," Carl suggested. "Nope, I can still hear it faintly on that receiver up front," Jerry observed as they reached the door of Mr. Singer's office. "You tell Mr. Singer to stall," he said desperately, "while I see if I can find what's gone wrong." As the rest of them filed into the office, Jerry turned around and started walking slowly toward the front of the store, tuning his little receiver back and forth across the low end of the broadcast band as he did so. Suddenly he began picking up the tone signal, but after he had walked about two-thirds the length of the store it began to fade out again. Backtracking, he found that the signal reached a peak when he was standing by the books the boys had tossed on the counter. He quickly spread the books out on the counter. Removing the receiver from his shirt pocket, he used it as a search wand to go over each of them. One large, fat volume on ancient history gave out a very loud signal. Jerry opened the book and made an astonishing discovery. The first and last few pages of the book were intact, but the center of all the middle pages had been cut out. Inside this opening was the cap pistol still wired in its box. He picked up the book and, holding it behind him, stepped into the office. "Which one of you boys is named William Palmer?" Jerry demanded. The boy with dark auburn hair and freckles spoke up hesitantly: "That's me." "Then this must be your book with your name in the front of it," Jerry said quietly as he placed the book on the desk in front of Mr. Singer and opened it. The Palmer boy's face turned so deathly white that his freckles seemed to stand out in three-dimensional style. "I didn't really mean to steal," he stammered. "Honest, I didn't. It just seemed a kind of game, and the other fellows kept egging me on. Are - are you going to send me to jail?" "Come on, Carl," Jerry said as he headed for the door. Carl followed, but even after the door was closed behind them Carl and Jerry could still see the pale frightened faces of the two boys and the stern serious look on the face of Mr. Singer. "What do you suppose Mr. Singer will do with them?" Carl wondered. "I'm not sure, but it will be what's best for the boys," Jerry declared with conviction. "They just don't know how lucky they are that they were caught by a fine man like Mr. Singer. You can bet he'll not let them off too easy. From the looks on their faces, though, I think they've already learned their lesson." "But they'll never know it was Elmer, the Electronic Flatfoot, who put the arm on them!" Carl said with a grin.